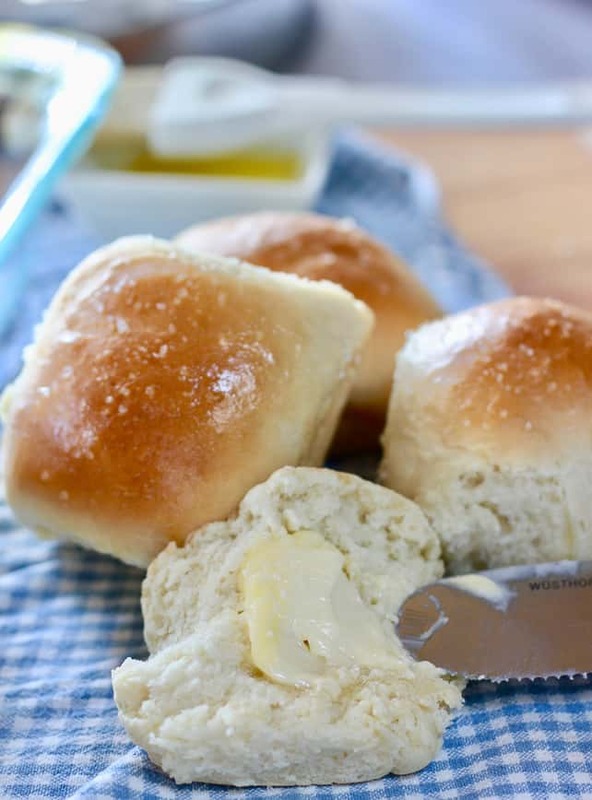 Easy Homemade Rolls – One rise is all it takes to bake up these beauties! This recipe is unique and delicious! Make these once and you will never go store bought again…they are that easy. And check out the new video we just added below! Whats the secret to a great one rise roll? Nothing fancy…just simple ingredients put together in a unique way. 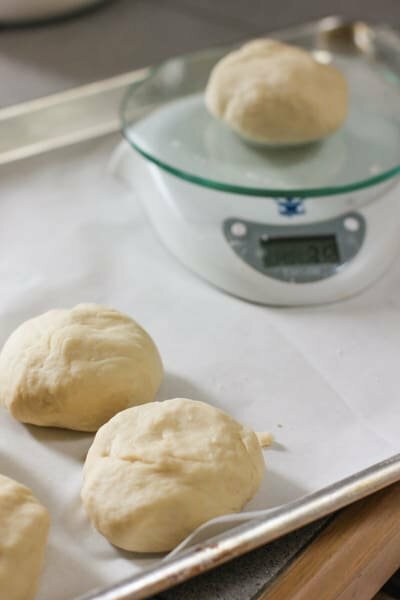 How to make Easy Homemade Rolls with only one rise! Simply mix and knead your dough. Shape into rolls and let rise in a 170 degree oven for 30 minutes. Then crank up the heat to 350 degrees for another 20 minutes, without ever removing the rolls from the oven! Brilliant! This recipe makes 12 rolls. If you need 24, we have that recipe for you! 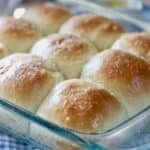 Easy One Rise Rolls for a Crowd! You certainly do not have to weigh each roll, but if you wanted to be sure you got an even dozen, they would weigh 3 ounces each. Or you could just roll into a log shape and cut up evenly into 12 pieces….like a normal person. Place your rolls on a sheet pan or in a buttered 9 x 13 baking dish. Place in your oven set for 170 degrees until double in size. They should look like this after 30 minutes. Now turn up the heat to 350 degrees without removing them from the oven and bake for an additional 20-25 minutes until lightly brown. Brush with butter and sprinkle with coarse salt if desired. 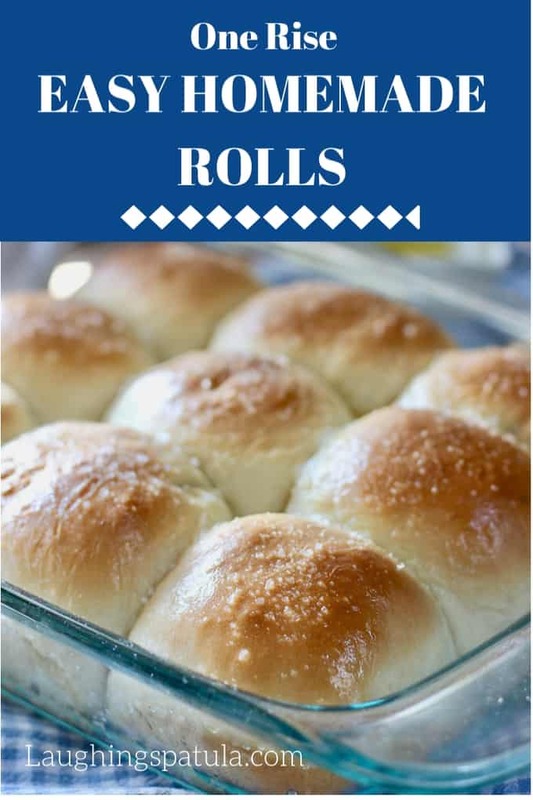 My Tips for Making Easy Homemade Rolls! Serve these the same day you make them for best results. We love these with homemade honey butter. One cube softened butter mixed with 1/4 cup honey. We used regular yeast, not Rapid Rise. 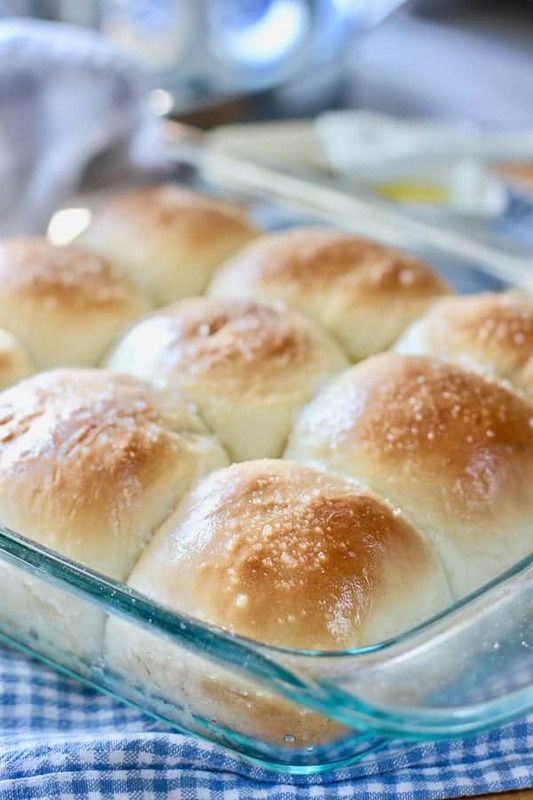 These rolls would be fabulous with our Beef Barley Soup recipe! Need a better visual? 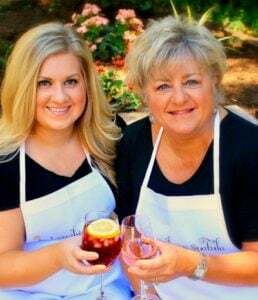 Check out this video we made- it shows you how we make our easy HomeMade rolls step by step! Yay! To Buns in Your Oven! I use a Kitchen Aid mixer with dough hook for this recipe. But you can use your hands, they work great too! Add 3/4 cup hot water (should be slightly uncomfortable to the touch). Add 2 cups of flour and yeast - mix for about 1 minute. Add another 2 cups of flour, one at a time. Add additional flour if needed until dough separates from the bowl. Put into preheated 170 degree oven to rise. This takes about 30 minutes. Once your buns are the desired size (sorry, can't help it, gotta get one in!). Turn up oven to 350 degrees without removing from oven. Bake for about 20 minutes or until lightly brown. We love this served with honey butter! 1/2 cup softened butter mixed with 1/4 cup honey. Brush with melted butter and sprinkle with course salt if desired. These are best served the same day you bake them. Need more buns? Check out this same recipe for a crowd. It makes 24 rolls! When you say cut the rolls, are you rolling the dough out and using a biscuit cutter? Can I shape them into knots instead? I use a knife and cut them into pieces before shaping. I have not tried the knots but don’t see why you couldn’t do that. Would love it if you would let us know! hey there! Can this be made the night before or are they better to bake and serve immediately? Thank you! Hi Michele – day two is nothing like day one but you could do it. I use the leftover buns for sammies all the time but there is nothing like fresh out of the oven rolls! Buns are in the oven! I made 1 dozen buns. The recipie does’nt say the quantity, but this looked about right. A 9 x 12 pan. So far they are looking wonderful! I meant Kitchen Aid but your hands will work too! I’ve updated the recipe…hope they came out great! Well that makes this blogger’s little heart go zing! So glad you and ‘Mr. Pattie’ loved them! Curious what type of flour is acceptable for this recipe? Thanks so much! Unless specified AP works just fine! Could wheat flower be used? I have not tried whole wheat but I would think a 50/50 mix would be okay. thanks! I made these rolls tonight with some chicken noodle soup and OMG were they amazing! Seriously so freakin good! I’m so glad you loved them! The first time I made them I though ‘uh no way are these gonna work’…glad I gave it a try…homemade bread forever! Just made these…they came out amazing.. great recipe. ..thanks a bunch..
do you dissolve the yeast in a bit of warm water, or just put it in dry with flour? also, could you double the yeast to get a better rise? i have a hard time getting enough rise when I attempt home made rolls. Hi Gina – you just add yeast to the flour like instructions suggest. It’s a bit of a crazy recipe! Do not add another package of yeast – you will have mega buns! 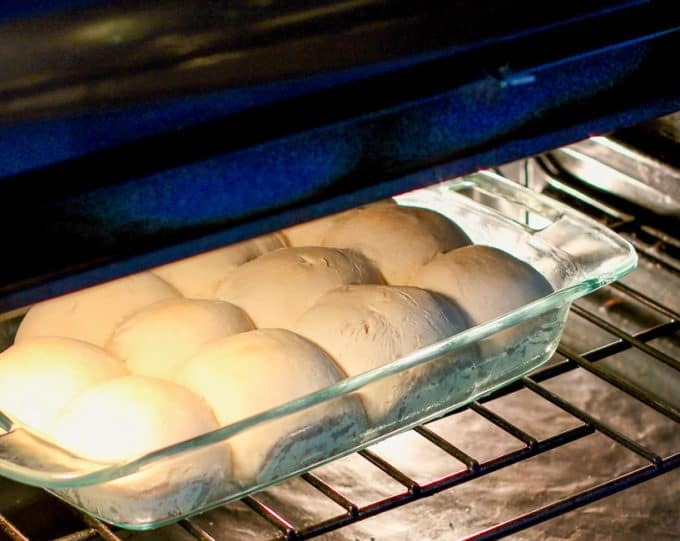 These rise in a 170 degree oven so you don’t have to worry about a warm place for them to double like most bread recipes. I’d love to hear back if this recipe worked for you! Just baked my first batch. The rise was not as I expected. The rolls were a little dense, I followed instructions to the letter, except I took the temp of the warmed milk and the water in order to keep from killing the yeast. I used Gold Medal “Better for Bread” flour as my mother always used when she made rolls. Guess it’s just not in the cards for me to make those light and fluffy rolls like she used to make. The flavor was good though. Well gosh Gina, I am so sorry! Bread can be fickle. I have made these a half dozen times or so and do recall a time where the interior was a little ‘gooey’. Yummy but gooey…. Try them again please and give the first rise a bit more time …that might solve the problem. This recipe works brilliant for me. Thank you so much for sharing. Do you use self rising ,plain,or all purpose flour?Hate recipes that don’t say what kind. Dont hate me! LOL! All purpose. I’ll update the recipe card…thanks! Absolutely fantastic, I actually already have this pinned on Pinterest, must have seen it pinned by someone else. I have now started following you as well. I am going to make some time this weekend and have a crack at these, can’t wait to share the results.